Monitor the Web for interesting new content about your name, brand, competitors, events or any favorite topic with Talkwalker Alerts! Learn why you should choose us over Google Alerts! Elevate your Alerts. Stay on top of every brand mention. Say goodbye to an inbox flooded with alerts from a gazillion feeds. 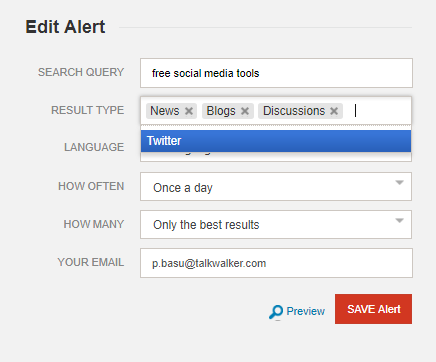 The all new Talkwalker Alerts makes social listening easy and brings every single mention of your brand across the internet - from websites, blogs, forums and even Twitter to your inbox in one email. So, if you’re looking for Google Alerts alternative, look no further! 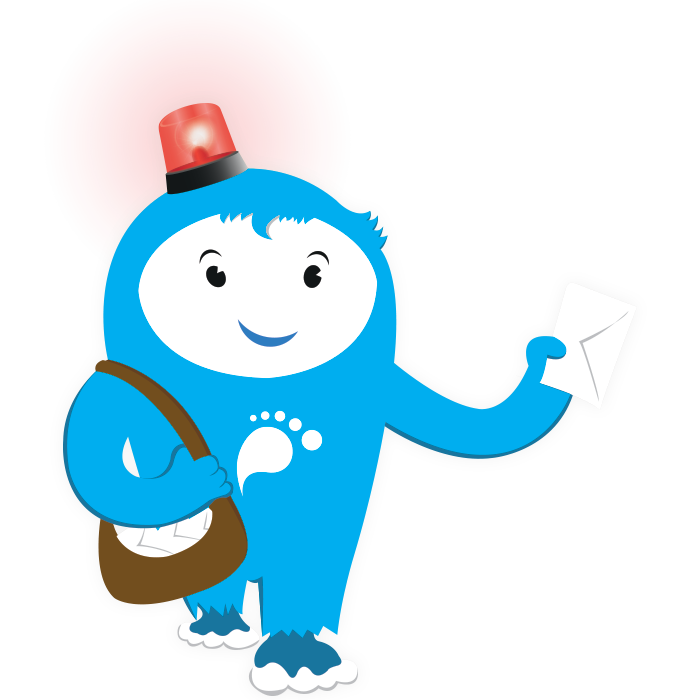 Talkwalker Alerts delivers the top results and tweets that make up your digital footprint from across the web and Twitter to your inbox. Social media analytics filters out and cover the most important conversations – tweets with the most engagement – so you only receive the alerts that matter and can customize your strategy accordingly. This makes us the only free marketing tool that includes results from social media. Catch up, Google Alerts. Eliminate the noise. Why work harder when you can work smarter? Use our Boolean operators to narrow down on the results that matter the most to you. Customize your alerts so you receive only the most relevant ones. Alerts can be used for more than just tracking mentions - it can actually be used to help define your brand startegy. You can up your SEO game, identify influencers and enhance your content marketing strategy…. All for free! Receive the most important conversations in your inbox every day. Don't take our word for it to - check out what they have to say! How can I set up an alert? Step 1:Pick a topic to set up an alert and enter it into our alerts search bar as shown. 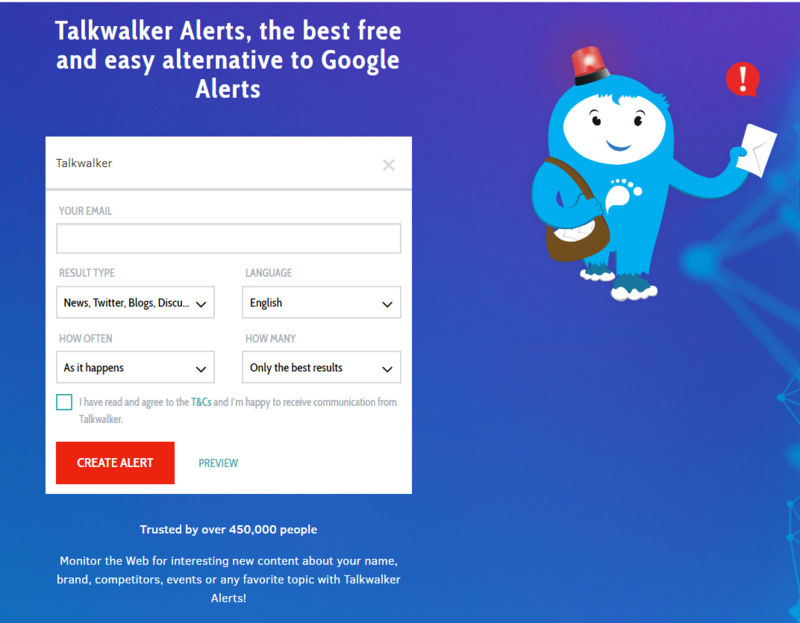 Step 2: Enter the email address where you would like to receive your alerts - unlike Google Alerts (linked to your Google account), you’ll receive Talkwalker Alerts at any email address you wish to use. Step 3: Choose where you would like to receive alerts from: News, Twitter, Blogs or Discussion forums. I’ve chosen News and Twitter here. Step 4:Choose the language of your results. In this case I’ve chosen French. We offer results in 22 different languages. Step 5: Select how often you would like to receive alerts in your inbox. I’ve chosen “As it happens” because I like to use it to keep an eye on Twitter in near real-time. Step 6: Select whether you’d like to receive all mentions of your favorite topic on the internet or only the ones with the most engagement. I’ve chosen “Only the best results” since I selected “As it happens” in the previous step. If I choose “As it happens” and “All results” for the same query, then I’ll flood my inbox during the day. This feature is however very relevant in a communication/PR crisis situation. Step 7: Use our preview feature to check that everything is set up as you would like.. Step 8: Hit the “Create Alert” button. All you have to do after this is verify your email address and we’ll start sending you alerts straight to your inbox. Oh and in case you’re wondering, the entire set-up takes less than 30 seconds! As an existing user, why do I not see Twitter results in my Alerts? This could be because your existing alerts did not have Twitter pre-selected in the result type. But there is an easy fix for this - all you have to do is go into your dashboard, hit "edit" next to the alert you'd like to see Twitter results for and add Twitter for your result type. What can I do with Talkwalker Alerts? Talkwalker Alerts can be used in multiple ways. Set up an alert for your dream companies. Every time a new job is posted on their website, you’ll receive alerts. Filter jobs by the position you’re looking at and the country. For instance, an alert query such as "marketing manager" AND source country: FR, will show you all results for marketing manager positions in France. If you’re looking to enhance your website’s SEO and have a massive list of websites to reach out to, Talkwalker Alerts will help. Since we deliver results from the internet to your inbox every day, you’ll have a list of websites that mentioned your brand or your keyword and you can reach out to them and ask them for a backlink, instead of performing a Google search each day or logging into another tool. Additionally, since we bring you the tweets with the most engagement, you’ll also have a bunch of influencers to reach out to for collaboration and partnership opportunities. If you’re looking to simply track your brand or keyword online, Talkwalker Alerts will help you bring all your brand mentions from across the internet to your inbox. It’s pretty useful for daily stand-up meetings or quick reports on your online brand health.With the addition of Twitter results, it can also be used as a very basic CRM tool. Can I set up an RSS feed with Talkwalker Alerts? Yes! Setting up an RSS feed with Talkwalker Alerts is possible. In order to set up an RSS feed, you have to log in to your alerts account by clicking on Talkwalker Alerts, and then click on the “Manage” tab. Next, you simply have to click on the RSS icon next to the alert for which you would like to create an RSS feed and copy the XML file. Then add it to your feed reader, such as Feedly. Oh and in case you’d like to set up an RSS feed for all of your alerts, you can click on the master RSS icon above all of the alerts and then paste it as a new source in your feed reader. Et voila: Your RSS feed is ready and good to go. What do free marketing tools like Talkwalker Alerts and Google Alerts do? We’ve all read the usual pitches - an alerting system helps you monitor your favorite topics, your brand, your competitors,and your industry across the internet. But what does this mean for you? How does this make a difference? Simply put, a free marketing tool like Talkwalker Alerts - which brings results to your inbox from around the internet as well as social platforms like Twitter and Reddit - helps you save time and increase your productivity. And this, is why we’re better than Google Alerts. Let’s say you’re a digital marketer and instead of arriving at work, getting a coffee, and monitoring Twitter, Reddit and the internet for brand mentions, you will receive an email with all your alerts, without spending a second doing any of the time consuming research. 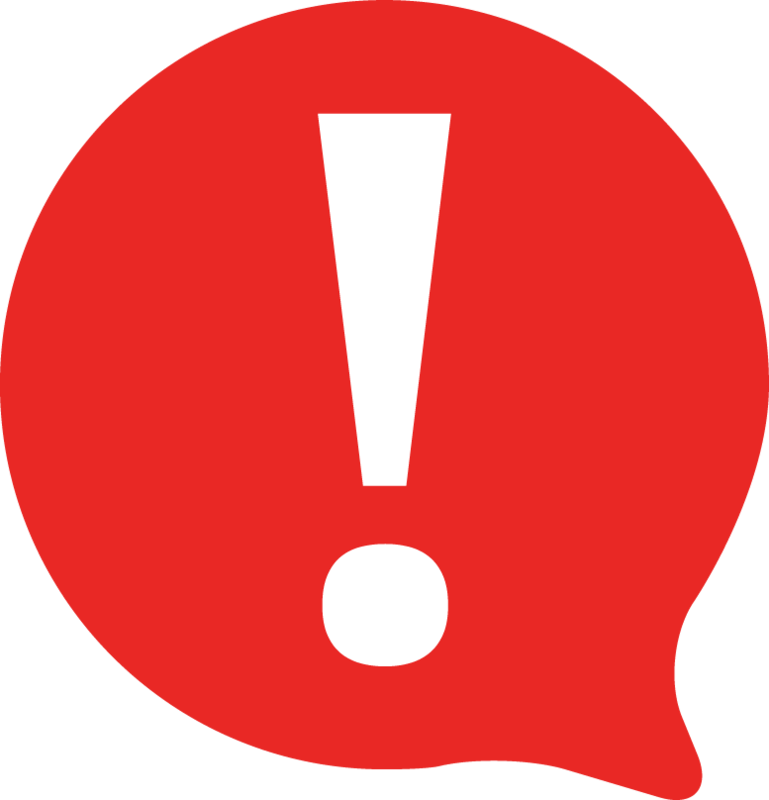 Additionally, Talkwalker Alerts help you be prepared in case a crisis threatens your brand. If you have a communication crisis, the first thing that will happen is it will reflect on your social channels. Since we provide results from Twitter, you will be able to see the most relevant and engaged tweets in your inbox at a glance. This means you don’t have to go through every single conversation on Twitter, dealing with the repercussions of the crisis.